The image on the left is a Palomar Digital Sky Survey image of the region of the Orion Nebula that contains Herbig-Haro objects known as HH1 and HH2. 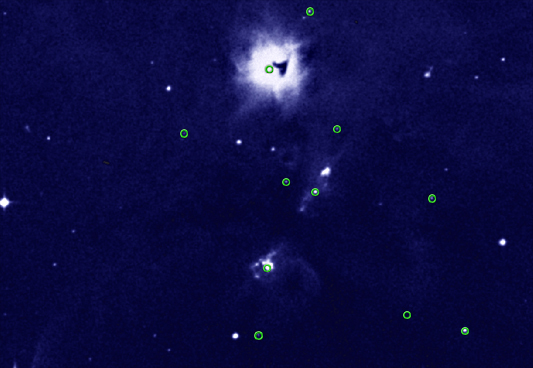 The inset (right) presents a zoom that shows the position of the X-ray source (green circle) detected by Chandra in HH2, superimposed on a false-color optical image from the Hubble Space Telescope. Herbig-Haro objects (HH) are clouds of dust and gas that are either part of high-speed jets of gas streaming away from very young stars, or clouds of gas that have been hit by such jets. The detection of X-rays from HH2 implies that a 600,000 miles per hour jet is plowing into a slower moving cloud. The resulting shock wave heats gas to a million degrees Celsius. The young star producing the jet is heavily obscured and detectable only with infrared and radio telescopes. In the image on the left, it lies about halfway between HH2 and HH1, the small bright cloud above and to the right of HH2. Coordinates (J2000) RA 05h 36m 25.06s | Dec -06° 46´ 16.00"